Recommended to: Readers who enjoy magical realism, and quirky protagonists. For many years, Alice Hoffman's books have been sitting on my reading list. When I first wanted to immerse myself in Magical Realism, it was her books that most of my trusted fellow bookworms pointed to. Sadly, I still haven't gotten to any of them. 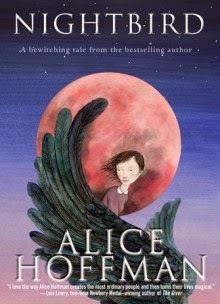 Which is why, when I saw that Nightbird was not only a new story by Alice Hoffman, but an MG book as well, I was instantly sold. There are a lot little pieces to completely fall in love with in this story, not the least of which are the characters. Each one is completely original, and has a sense of whimsy about them that just adds to the magic of this story. Twig was absolutely wonderful as a main character. Sweet and honest. Brave and true. Her story of sweets and secrets swept me up, and carried me along. I only wished that there had been a bit more depth to all the amazing people who populated this story. While the writing is gorgeous, the characters felt lacking to me. I loved of a small town full of quirky people, and I would have liked to learn more. In fact, despite my fervent ardor for the story at the heart of this book, I felt like much of it wasn't fully explored. I'm very much in favor of MG stories that don't underestimate their audiences. Young readers deserve complex plots, exciting twists, and honest depictions of emotions just as much as any other age group. Which is why I had to knock my star rating down a bit for Nightbird. As I mentioned above, the writing is lovely and matches the magical nature of this book perfectly. If only the characters had been stronger, and the climactic points a bit sharper, this would have been a perfect read for me. As it stands, Alice Hoffman has still proven she is a strong MG writer. My glimpse into her first book for younger readers has further strengthened by want to read her adult books as well. I'd recommend this story to young readers who love magical realism. Readers who look at the world, and see not only what is, but what could be as well.